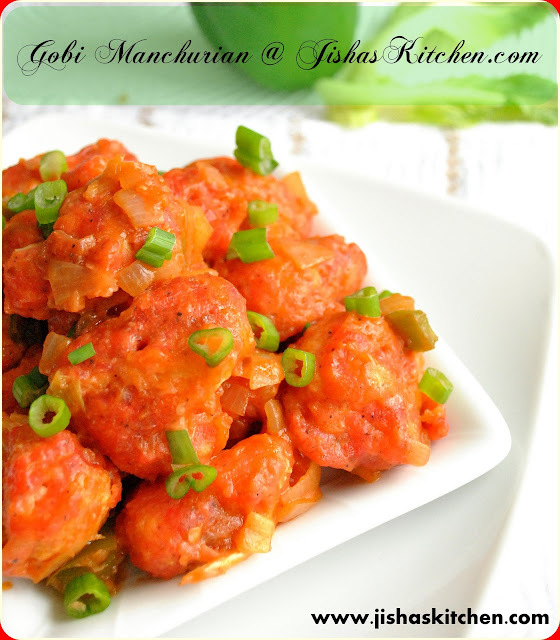 Today I am sharing the recipe of Gobi Manchurian which is an Indo-Chinese dish. Indo-Chinese recipes are very popular among Indians. Even I am a huge fan of that. When I was working in bangalore, I was a regular visitor of Chungs chinese restaurant at Jayanagar.Couple of days back, I was having a chat with one of my friend who was there with me in Bangalore. She told me that she went to this restaurant recently and that's it, after our conversation I called my hubby and told him to buy a cauliflower while coming back from office. I made this on that same day. 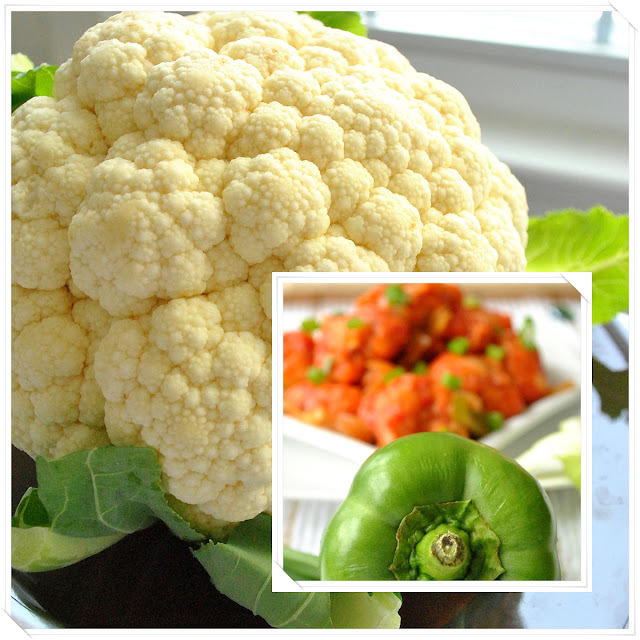 First discard the green leaves and thick core part of the cauliflower and cut it into medium size florets. Then put the cauliflower in hot water for about 10-15 minutes.Then first drain and then pat dry them using a towel. Then in a bowl, mix 1/2 cup corn flour, 1 cup all purpose flour, 3 tbsp rice flour, 1 tsp pepper powder, red food color and enough salt. Then add lukewarm water little by little to make a thick paste. Make sure not to make it very watery. Heat oil in a pan and then dip the florets in this batter and then deep fry them in batches in a medium-low flame until it becomes golden brown in color. Then place it on a paper towel. Then heat 2 tbsp of oil in a pan and add chopped spring onions (Only the white part), diced onions, chopped green chillies, chopped garlic, diced capsicum and saute till they become soft. Meanwhile mix 1 tbsp of cornflour in 1/2 cup of lukewarm water and add this to it followed by soy sauce, chilly sauce, tomato sauce and salt. Simmer for about 5-10 minutes. Then add the fried cauliflower florets and in a medium flame, toss it continuously till all the florets are well coated in the sauce. Finally garnish with chopped spring onions (green part). Enjoy immediately with chapathi / Fried Rice / Noodles. same pinch....just made it with cauliflower and broccoli...didn't go whole way and make it manchurian but only till the pakodas to eat with dinner! wow!! !tempting pic! !beautiful clik and presentation jisha! that is one lovely bowl of gobi manchurian great presentation! 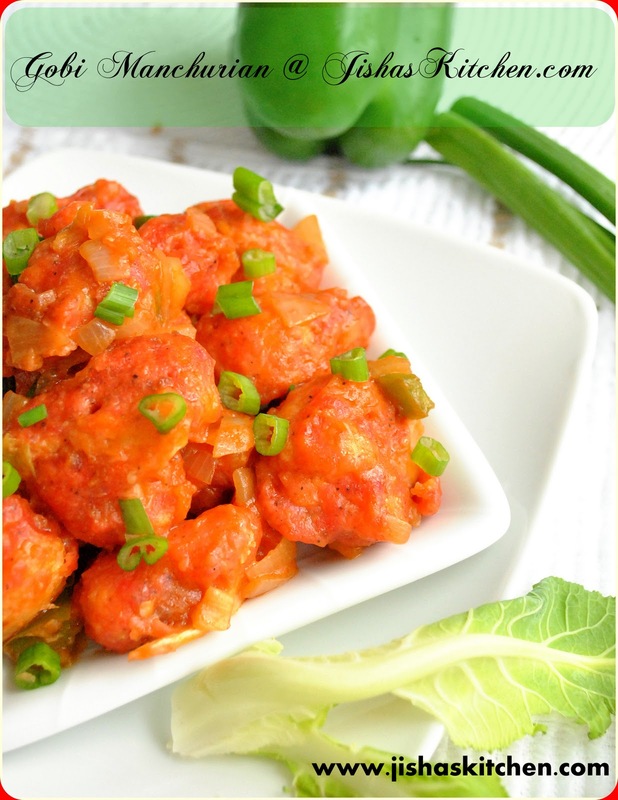 Love gobi manchurian,this looks awesome, me too have one in draft, but this is so inviting..love your clicks dear. Enikum Blore days rorma vannu ethu vayichapol. i used to buy gobi manchurian from shanthi sagar, on my way home,ahhh. Love it..This is exactly how I make it too :), except the rice flour part i guess. Gobi manchurian looks delicious. Love it. Woww marvellous and beautiful gobi manchurians...Just drooling.. I don't need any accompaniment for this, I can just enjoy this on it's own. Looks very very tempting. Wow beautiful pics... nice colrs.. and great recipe..
makes me remember about thailand!!! yummyyy!!! Manchurian looks great..you have a great and wonderful snaps here. When you say tomato sauce,you mean ketchup? it looks yummy....i have been trying all ur recipes...and it comes out great !!! keep up the good work ! !